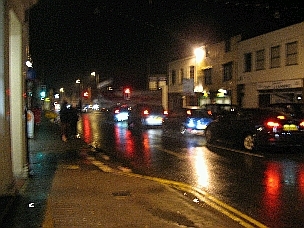 The Abingdon Blog is a photo record of events and places in Abingdon, Oxfordshire, started on January 1st 2006. The left filter light along Ock Street has just been turned on. 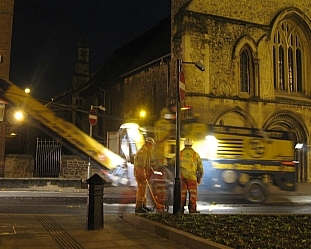 Work must be almost complete on the Stert Street - it is closed overnight from the 19th to 22nd November for resurfacing. Abingdon is to be awarded the prestigious 'Most dug up town in Oxfordshire' award for the second year running with thanks to the guys from County Highways who have made all of this possible, and Isis Accord who did the real hard work. If we can win again next year, we get to keep it. I understand Abingdon was gridlocked this morning...they found a hole in Stert Street and all the electrics were out as well...hey ho! As you can see the road surface is like a mirror. You can see the headlights of the cars coming towards you twice.You can also see all the lines in the road even the ones they tried to cover with black paint. Didn't they just get rid of a manager today for setting himself extreamly low standards then failing to live up to them ? On Tuesday night I drove from the middle of Ock Street, round by Coxeters and tried to turn right onto Stert Street. Shut! But you don't know that until you're right on top of the junction. I understand that this morning, the signage was just as bad coming the other way from the Vineyard. Not only are we the most dug up town, we're the owners of the worst signage too.